Maybe I picked the wrong week to go on vacation. I’m back from an eight-day swing through North Carolina, and only had 30 minutes of sports-related activities in that span. It came when we got off the highway in Zebulon, North Carolina. We had to see the water tower that overlooks the ballpark home of the Carolina Mudcats of the Carolina League. It’s painted to look like a baseball. Then when exploring the field, an employee of the Mudcats spotted us and offered to show us around the park. It looks like a fine place to spend a summer evening, with seats close enough behind home plate to remind me of the area in the same spot at War Memorial Stadium. Otherwise, I had to rely on television and the smartphone to keep up with what was happening back home in sports. And there was a lot. Now that I have the chance, allow me to offer a few comments on the weekend … and what followed on Tuesday. Before the draft, the Bills had loaded up with high picks – two ones, two twos and two threes. We all knew that the team needed a quarterback badly, and we knew after the Jets’ trade with the Colts to move up that it would be expensive to get one. But Buffalo gulped and paid the price to pick Josh Allen of Wyoming. 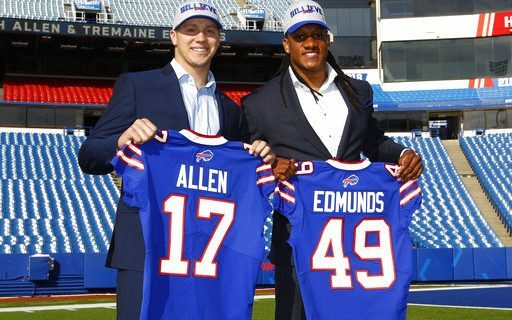 Later the Bills gave up another one of those top picks, a third, to move up again in the first round and grab linebacker Tremaine Edmunds of Virginia Tech. So six picks in the first three rounds became three. Hmmm. Edmunds looks like he’ll help immediately, but the other picks probably will have to wait their turn. The Bills strike me as a team with a lot of needs, and the strategy of giving up quantity for quality struck me as a little difficult to embrace. And I wasn’t thrilled about the selection of Allen. He’s a project of sorts, someone who had accuracy issues in college, and you never know how that will work out. Greg Gabriel of Buffalo Sports Page and Pro Football Weekly wrote that Allen is the type of player that could ruin careers of talent evaluators if he doesn’t turn into a standout. On the other hand, this particular group of football executives led the Bills to the playoffs last year. I’m willing to give them the benefit of the doubt for the time being. Wait a minute – did I hear right? Good fortune actually smiled on the Sabres? Indeed. Buffalo struck it rich with the draft lottery, which was announced on national television on Saturday night. The Sabres had less than a 1 in 5 chance of getting the first pick, and that’s exactly what happened. What’s more, the lottery victory came in a year when the best player in the draft – Rasmus Dahlin – is a defenseman. The Sabres already have Jack Eichel and Casey Mittelstadt up front, and they figure to be the cornerstones of the team’s offensive future. What was needed was a game-changing defenseman, and Dahlin has every chance to be that player. In a couple of years, Dahlin could slide in as the team’s best defenseman … and make life easier for everyone else on the blue line by allowing them to have slightly less responsibility. It will be interesting to see if the Sabres rush to sign him now so that he arrives this fall, or if he stays in Sweden for a year to continue his development there. No matter what happens, though, the lottery was a ray of sunshine for a team that has been under a dark cloud for years. Maybe there is a statute of limitations about bad karma caused by a tank. So both the Bandits and the Knighthawks needed to win to keep their playoff hopes alive, and Rochester was the one to advance. Think ex-Bandit and current Knighthawks Billy Dee Smith still has a smile on his face over that result? Smith, as you recall, was allowed to leave last summer as a free agent after a long stay with Buffalo. The Bandits finished last a year ago, and did a makeover to their roster for 2017-18. The results were mixed, but the team lost its last three games and still missed the playoffs for the second straight year. That hadn’t happened since 2002. My guess is that it won’t be any more acceptable now than it was then. Buffalo has all sorts of advantages in the NLL. The Bandits are close to the large talent pool in Southern Ontario, so good players want to play here, and it draws enough fans to have financial muscle. They are expected to win, and they haven’t. Who pays for that? The team changed the roster around to get younger this year. If the front office wants change after a second disappointing season, it has little choice but to look at general manager Steve Dietrich and/or the coaches. The month of May figures to have some interesting discussions about the future of the franchise – if they haven’t started already. … just when I had finished hanging up all the laundry from my vacation, the Pegulas announced the departure of Russ Brandon from the Bills and Sabres on Tuesday. Considering that they were the ones that gave Brandon the added responsibilities of running the Sabres while guiding the Bills, it caught me by surprise. There are plenty of reports out there on what might have happened and what will happen, but I’m not really prepared to analyze the effects of the move until I see what sort of plan is put in place. But let’s get one point out there – I never thought that having Brandon serve as president of both the Sabres and Bills was a good idea. A pro sports team is a big operation these days, involved in a wide range of activities. It’s tough to keep track of one sport, let alone two. I’m not sure how Brandon found the time to serve the two masters at once. If he did. And if Kim Pegula is indeed going to run the Bills and Sabres along with PSE, the Pegulas’ entertainment business, well, that’s more than a full plate. That’s an entire buffet table. She’ll need to learn quickly how to delegate authority. The past offers a clue on how things can go wrong. Seymour Knox served as owner and president of the Sabres back in the day. Knox had his own life to lead – investments, community work, etc. – in addition to presiding over the hockey team. When he had strong leadership in Dave Foreman and Punch Imlach in the 1970s, the organization did fine in those simpler times. When they departed, the organization suffered. The Sabres of the 1980s never really had a full commitment to winning, and it showed. It had been a good week for most of “One Buffalo” until this announcement, unless you were a Bandits’ fan. Now it’s fair to say a bit of a cloud hangs over the local sports scene as we wait to see what’s ahead, and it’s going to be a while before we know when the skies might clear.